To prepare simple, tasty Italian food it’s important to use the best quality ingredients you can find. Vorrei have created this fabulous Italian Essentials Hamper which brings together all of those essential items in one place, from extra virgin olive oil and aged balsamic vinegar to bronze die cut pasta and the renowned San Marzano tomato passata. All of their products are natural and healthy and do not contain any additives, preservatives or colourants. They are perfect for creating a range of delicious Italian dishes! 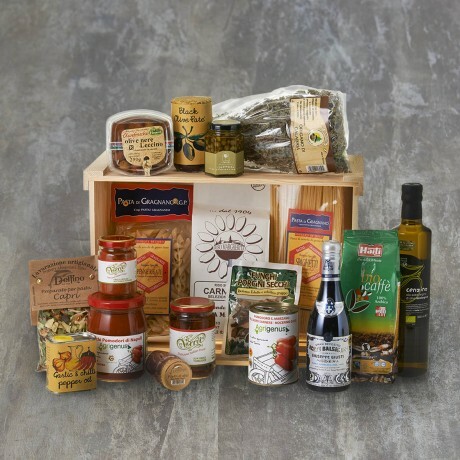 The Italian Essentials Hamper is presented in a useful wooden crate that will be handy for storage once you or your recipient has used up the goodies! Organic Extra Virgin Olive Oil (500ml).Giovanni Marvulli’s 'Cenzino' extra virgin olive oil from Matera, Basilicata is both healthy and full of flavour averaging almost three times the polyphenols of typical extra virgin olive oils (see our chart below). A certified organic oil, fruity with a distinct almond after taste and an elegant aroma, wonderful on salads, cooked vegetables, fish and seafood or simply drizzled on your crusty bread or bruschetta. Die Cut Spaghetti from Gragnano, Naples (500g). Our IGP (Protected Geographic Denomination) spaghetti comes from the home of pasta, Gragnano near Naples. It is a great quality product which retains its shape when cooked and tastes great. Calabrian Wild Oregano (50g). Our dried oregano has an intensive aromatic fragrance. It's wonderful for flavouring tomato pasta sauces and for sprinkling on tomato bruschette. Salina Capers in Olive Oil (90g). Our capers have IGP status (Protected Geographic Denomination) and come from the Island of Salina. They are said to be the best capers in Italy and also have 'Slow Food' status! Crunchy and full of flavour, they are a great addition to salads and sauces. Dried Porcini Mushrooms (25g). Our Porcini are classified as 'First Extra Quality' and come from the uncontaminated Sila National Park in Calabria. They are hand picked between August and October and are then dried naturally in the sun. Just open the bag and marvel at the amazingly strong, heady aroma - this is the first sign of their quality. Vorrei Dried Chilli Powder (156g). Fabulously spicy dried chilli powder, great for sprinkling abundantly on just about every meal! Organic Arabica Fairtrade Coffee (250g). The favourite coffee in Rome's coffee bars! This is a fair trade Arabica coffee which is full of flavour and ideal for use in Espresso pots, caffettiere and filter coffee machines.All breakable items are wrapped carefully and individually inside the wooden crate, the crate is then wrapped in cellophane and tied with a beautiful ribbon. A gift message option is available for you to send a personalised message to your recipient.